Shop our signed India cricket memorabilia featuring signed items by the India cricket team. Our collection features signed India cricket bats, balls, autographed India cricket shirts and photos. All with fast worldwide shipping, free UK delivery and Certificate of Authenticity. Many with signing proof. As India’s biggest and most popular sport, national cricket is a big deal across the country. It’s a sport firmly ingrained in the culture and psyche – played extensively throughout the nation. There are dozens of world-famous cricket grounds in India, many of which have hosted high-profile international tournaments. Although they got off to a slow start, they have now earned their place as one of the world’s most prolific and successful national cricket teams. Cricket was first introduced to India by merchant sailors from Europe in the late 1700s – but it wasn’t until 1932 that the nation was finally accepted into the international community, the sixth team to be granted Test cricket status. For fifty years India performed poorly in international matches – and it wasn’t until the 1970s that their play really started to pick up. This was largely thanks to a handful of star players – including all-rounder Kapil Dev and batsman Sunil Gavaskar. Then at the start of the 21st century, India began to win Test matches against the big three – Australia, England and South Africa. Soon the nation’s team became respected opponents, rising further to be ranked 1st in the ICC’s overall rankings, One Day Internationals and the T20 Internationals. Known as ‘Team India’ or ‘The Men in Blue’ by fans, the national team is a great source of pride for the nation. To date of the total 953 One Day Internationals played India has won 492. In the Twenty20 Internationals, they have won 66 of their 105 matches. The team has also won the Cricket World Cup on two occasions. They were the first team to win the World Cup at home. 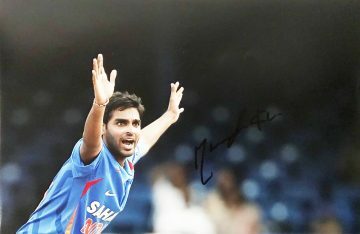 Buy signed India cricket bats, balls, shirts & photos at Firma Stella today. Our extensive collection features unique and exclusive items autographed by some of the nation’s star players – both past and present. Each item is supplied with a certificate of authenticity, to ensure complete peace of mind.